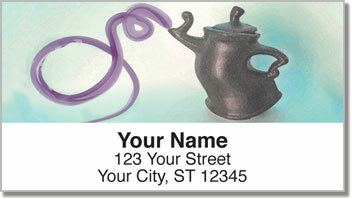 Hand-crafted ceramic teapots make attractive subject matter on return address labels that will give your outgoing mail appealing character and country charm. A purple paint stroke creates a pleasing puff of steam that flies out of the spouts of all four little teapots. These labels celebrate both the art of pottery-making and the age-old tradition of drinking tea! 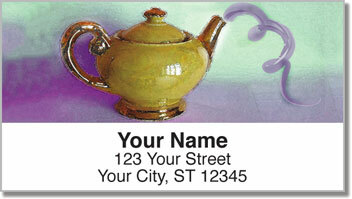 Teapot Address Labels from CheckAdvantage will save you a ton of time when preparing to send letters and packages. A convenient self-adhesive backing lets you simply stick them on every envelope instead of scribbling out your name and address every time. 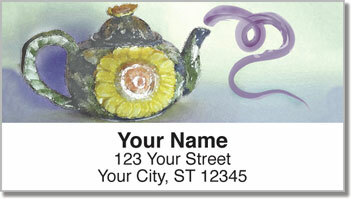 Make Teapot Address Labels your own today! 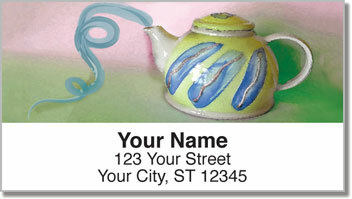 You'll also find this stylish selection available to order as a set of matching personal checks.